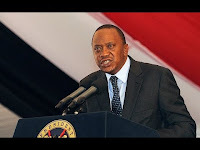 Monday February 4, 2019-President Uhuru Kenyatta has once again embarrassed Kiharu MP, Ndindi Nyoro, for associating himself with Deputy President William Ruto’s presidential bid in 2022. Nyoro is official campaigner of Ruto in Muranga but by the look of things Uhuru is not impressed with Nyoro’s work. Immediately Mr Nyoro rose up to speak at the funeral ceremony of Thayu Kamau at Kiharu Constituency on Thursday, Mr Kenyatta excused himself and went out of the tent only to come back when the MP had finished making his remarks. When he took the microphone Uhuru tongue-lashed the MP after he requested him to donate at least Sh5 million to Gitui Secondary School for development. “I hear some people asking for money. Account for the monies that have been allocated in your National Government Constituency Development Funds which are worth Sh100 million instead of loitering the country with endless meetings and unending speeches," Mr Kenyatta, who was visibly irritated, told the MP amid cheers from mourners. Nyoro was seen looking down when the President deflated his bloated ego. vampire stop lashing: account for Eurobond 1 and Eurobond that you've used to give to your handshake vampire in crime.